Located between the Ramah Navajo Reservation and the magnificent El Morro National Monument Park, eighty-eight acres of pure pleasure beckon your body, mind and spirit. Although rugged and remote, the land has a distinctively nurturing presence. Even the stones feel vibrant and inviting. Come to Oso Vista Ranch to restore, revitalize and rejuvenate yourself. Renew your spirit at this elegant retreat located in the breathtaking beauty of the high-desert mountains in west-central New Mexico. At Oso Vista Ranch, centuries of history and culture merge with natural peace and tranquility. Hike, explore, learn, grow and have a great time. Click here for day trips near Oso Vista Ranch. 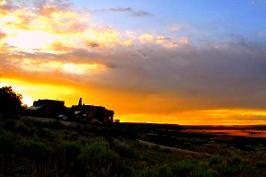 In the heart of the Zuni Mountains of New Mexico sits Oso Vista Ranch. One of the quietest, most restful and beautiful landscapes in New Mexico, this retreat center and vacation rental property awaits you with an open heart.